When I was a young girl some parent at my school asked me what I ate for breakfast. He was curious because my dad was the incredibly fit cross-country running and track coach. I was a successful competitive swimmer. He was looking for some nutritional hippy grains and greens like magic that aided our super athletic talent. The look on his face when I confessed that we had regular breakfast pastries has stuck with me all these years. I know I have been lucky. Not just genetically, but by growing up in an athletic and active lifestyle. Moving a lot and moving well was a basic family value. Which made the second family value of enjoying a lot of food quite digestible. I can entirely relate to these food pyramids for runners (or all endurance athletes). 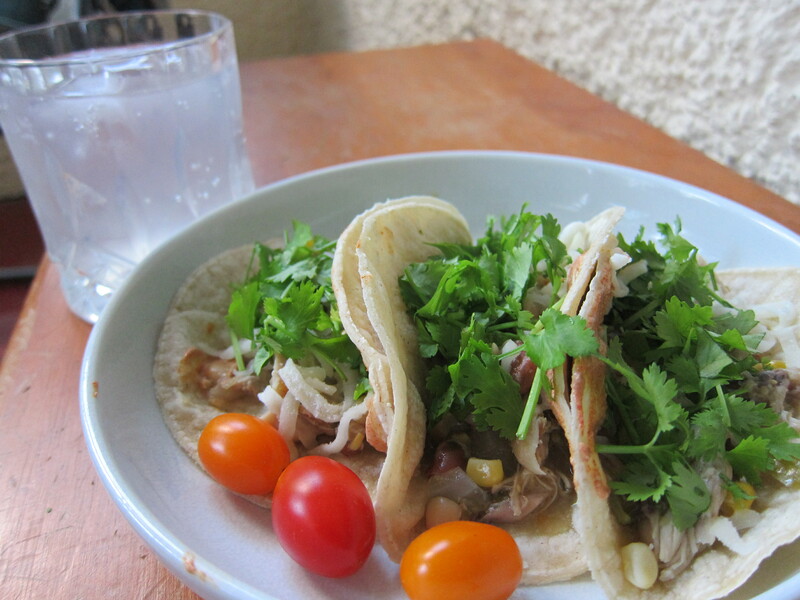 In the meanwhile I present to you my Slow Cooker Chicken Tacos. I made a whole boat load of chicken filling in the slow cooker. Then to assemble a taco I’d heat corn tortillas in a pan. Rip up some cilantro, sprinkle on some shredded cheese, add a smear of my spiced up sour cream (that I’ve used in quesadillas and salmon cakes). Ta-da! Dinner for the week. Keep in mind this is just a suggestion – you could totally adapt this to your personal tastes and whims. Bell peppers? I can’t remember if I used these. Whatever, throw more veggies in there! 1 can pinto beans, 1 can white navy beans (GOYA brand because Cooks Illustrated reported that the juice in the can is the bean broth they were cooked in, so much more like making beans yourself). I drained off excess liquid, but didn’t rinse the beans because I wanted the thick bean juice at the bottom of the can. If you are doing this vegetarian cooking quality dried beans would be excellent. 6-8 chicken thighs (bone in, skin and fat trimmed off). Bone in because the bones themselves give important nutrients and make everything yummier. And bone in chicken thighs are like one of the most affordable meats you can buy. ~.5c?? White wine. I didn’t measure and I used it just because I had it. Cooked on high ~5 hours until the chicken was falling off the bones. Removed big chunks to shred it. I recall having to remove the lid about half way through to let evaporation thicken it. Added a can of corn (wanted the flavor to be fresher and not as cooked in. Could also add corn cut off the cob for a nice sweet fresh crunch). Cook on high for 4ish hours or low for 7ish hours. Fish out the bones and the chicken just falls apart. Serve with cilantro, cheese, lime wedges, whatever. Update from 2017: We now eat this filling in many other forms. I’m a fan of the burrito bowl style. Will loves making it for breakfast eating it with eggs and wedges of fried tortilla. This entry was posted in Fitness, Kym Cooked and tagged athletics, breakfast pastries, chicken, Chicken Tacos, cilantro, cooking, fitness, food, food pyramid, healthy food, running, training. Bookmark the permalink. I like the 1:1 Donut to milage ratio. I never liked donuts before discovering the Baker’s Wife!